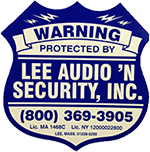 First Alert Professional Security Systems installation & service: Lee Audio ‘N Security Inc.
Lee Audio ‘N Security Inc. installs and services Honeywell Security Systems in New York, Vermont, and Massachusetts. Lee Audio 'N Security sells, services and installs Honeywell Security Systems. Secure your home or business with the world's leader in professional security systems. Contact Lee Audio ‘N Security Inc. at 800-369-3905 to set up a consultation.